The address of "2 Landsdown" is listed in Places recorded by the Registrar General under the provisions of the Places of Worship Registration Act 1855 (2010) as registered to the "First Church of Christ Scientist Stroud". The Christian Science Church building has a view across a park of St Lawrence's Church. It previously occupied Temperance Hall, a short distance away, on the opposite side of the road. 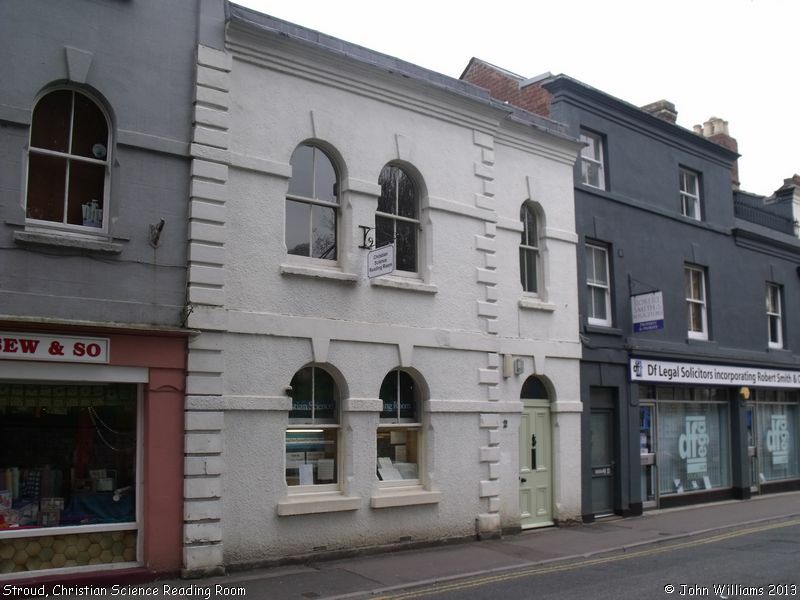 Christian Science Reading Room, Stroud shown on a Google Map. Information last updated on 8 May 2013 at 08:41. Please also remember that whilst the above account may suggest that Christian Science Reading Room remains open and accessible, this may not remain so. This Report was created 27 Mar 2019 - 11:19:48 GMT from information held in the Gloucestershire section of the Places of Worship Database. This was last updated on 7 Feb 2019 at 07:45.